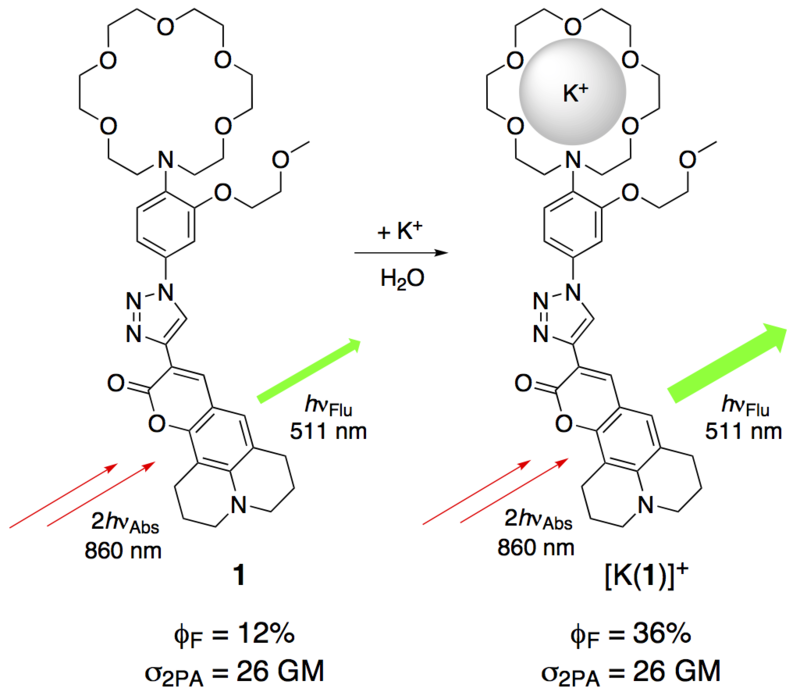 A highly K+-selective two-photon fluorescent probe for the in vitro monitoring of physiological K+ levels in the range of 1-100 mM is reported. The two-photon excited fluorescence (TPEF) probe shows a fluorescence enhancement (FE) by a factor of about three in the presence of 160 mM K+, independently of one-photon (OP, 430 nm) or two-photon (TP, 860 nm) excitation and comparable K+-induced FEs in the presence of competitive Na+ ions. The estimated dissociation constant (Kd) values in Na+-free solutions (KdOP=(28 ± 5) nM and KdTP=(46 ± 25) nM) reflecting the high K+ ⁄ Na+ selectivity of the fluorescent probe. The TP absorption cross-section (σ2PA) of the TPEF probe +160 mM K+ is 26 GM at 860 nm. Therefore, the TPEF probe is a suitable tool for the in vitro determination of K+.